Taped and worn and now finally broken beyond repair. This entry was posted in fall and tagged fall, garden, wordless wednesday. 😦 I hate when that happens. Me too, but I think I got my money out of this one! Sniff. Get a metal one next time. Worth the extra bucks. A metal rake is not a bad idea. If you look you’ll notice over the years I completely wore the tines down to nubs wthout any hook to them. You had to hold the rake upright in order to rake leaves! 🙂 I have yet to put him out with the trash…. still letting go. You must have been raking an awful lot of leaves. I agree with Cathy, you need a metal one. Lucky you … I LOVE an excuse to buy new gardening tools. Oh no!!! 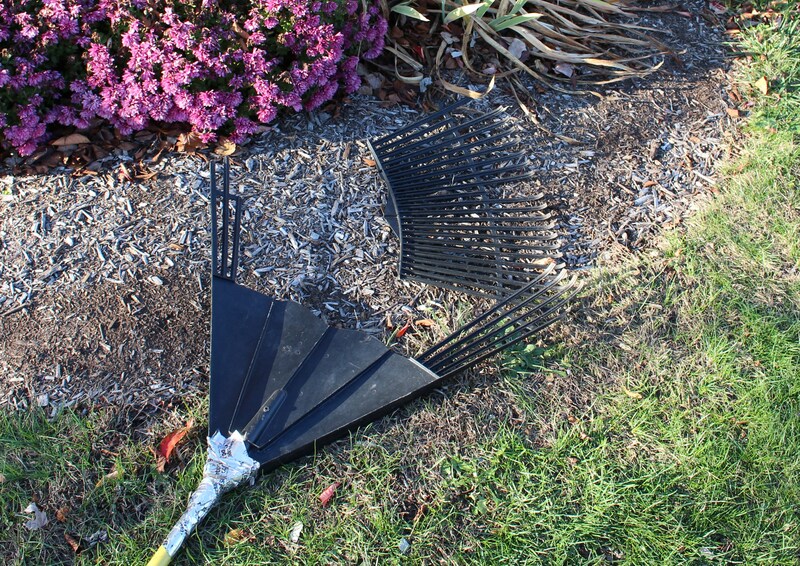 I don’t have a favorite rake, but I don’t even know what I’d do if my favorite shovel ever broke. This rake has been with me for years. Maybe not a favorite, but years of service counts for something! Condolences. Once was hoeing extra vigorously with a Dutch hoe and the head broke off. There’s always that moment of shocked disbelief when a tool falls apart mid-swing. Second only to the shocked smack which happens when you step on the head of a hoe left on the ground… and the whole thing pivots up to hit you. You have my sympathy. It looks like he had a long, full life and served you well. Believe it or not, someday the sound of new tines scratching at leaves will gradually replace the pain and eventually you’ll smile while fondly remembering your friend fallen in the line of duty. Haha, missed this comment earlier! 😀 That is funny. You really get the last bit of use out your tools.